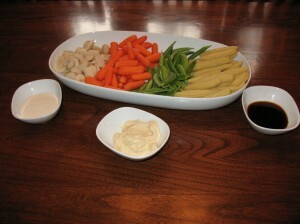 As you may remember, I recently hosted what I call the annual Crafty Girls party. I started doing this party a few years ago because I liked the idea of getting the girls excited for holiday stuff beyond the presents on Christmas morning and because I like slightly-too-ambitious craft projects. We do it after school, and some kids come straight home with us while others show up a bit later. Many of the entertaining elements are the same year after year. There’s the obligatory punch bowl. I got this at a garage sale and it might be the best $3 I’ve ever spent. I highly recommend acquiring one if you’re a parent of daughters. The first year I served real punch, but it was too exotic for the youngsters, so now I just serve pink lemonade with frozen raspberries thrown in to make it extra fancy. 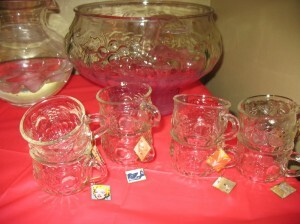 This year I had a brainstorm and put wine charms on the punch cups, which was festive and functional. Then there’s a big platter of vegetables. This is the only food that’s always available, but–oh yes–pigs in a blanket, mini-pizzas, cheetos, and cookies are also served. But the food isn’t the main event. It’s all about the craft. In past years we’ve decorated gingerbread houses, decorated mini-trees, and made ornaments. 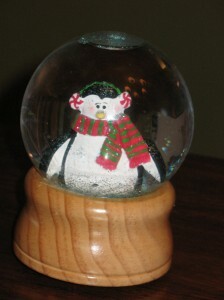 This year, I took a commenter’s advice and went with Snow Globes. This can be a simple craft, and if you Google it up, you’ll see lots of directions using jars and florist clay to make a nice little snow globe. That would have worked great, I’ll bet. But once again, I was too ambitious. See, I like to do a really nice craft. And so when I saw that National Artcraft sold real, snow-globey snow globes, and that they were cheaper by the dozen, I thought it was a terrific idea. I’d have enough for the girls, plus extras for each set of grandparents, possibly even my neighbor Mary and teachers, depending on my RSVP rate. Of course, the problem is that I had unwittingly taken my craft from the good-enough, cute-for-a-little-kid level and raised it to something that was more fabulous but also labor-intensive. So that, days before the party, I was freaking out over my serious craft problems . Here’s why. I started off with the idea that I’d follow basic directions like these or these, which would have had me cleaning out a jar, sticking some figurines onto the lid with clay, screwing the lid on, and sealing it with hot glue gun. No problem-o. Or so I thought. First, Cute W told me that the hot glue gun just wouldn’t work. It’s not flexible when it’s dry, so it would end up cracking and leaking. He came home with silicone sealant, which requires a caulk gun, a big metal apparatus designed to intimidate people who are not handy. Seriously: I’m still congratulating myself over getting over my fear of the glue gun. I managed to avoid handling the equipment almost completely by delegating this job to my ever-helpful friend C. But not before busting a pair of scissors trying to get the sealant tube open. Now, that’s discouraging enough. 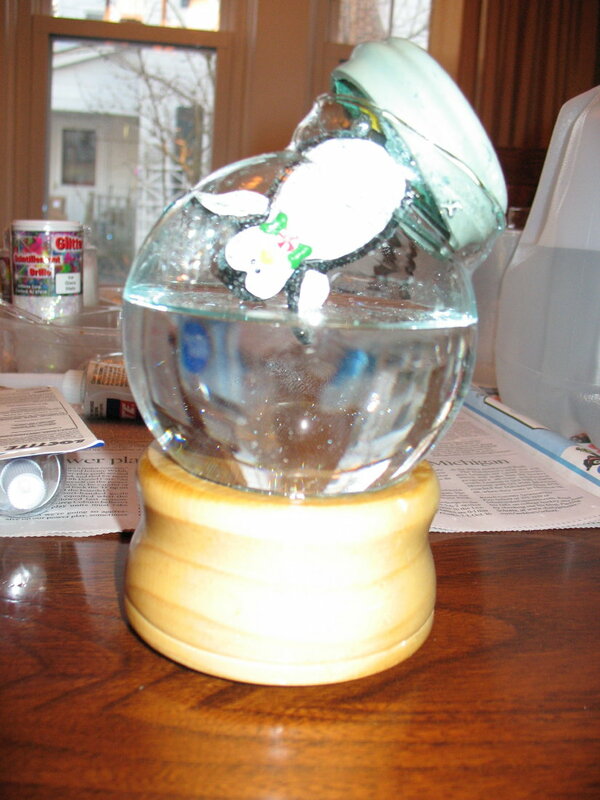 But having such delicate globes meant that I had to be extraordinarily careful about releasing the air as I placed the stopper into the globe so that the water and air pressure together wouldn’t break the glass. Apparently I was only ordinarily careful. It’s difficult to tell in the picture, but one little penguin flipper went right through the glass. So that water, mixed with greasy silicone, glitter, & small shards of glass, spilled all over my living room table as my daughters looked on in horror and I cursed myself for doing this craft in particular and the stupid party in the first place. It was challenging putting the lids on, and my plan was to put together eight of them while children were flinging themselves around my house. Do you see, here, that I’m crazy? That it’s better for me to spend too much time writing a blog because at least it prevents me from wreaking more havoc around the house? The silicone didn’t just work better than the clay: it also looked more like real snow. Incidentally, the figures are all from Oriental Trading Company. They’re ornaments, but you can just rip off the hooks and you have cute little water-resistant figures. We set those aside. 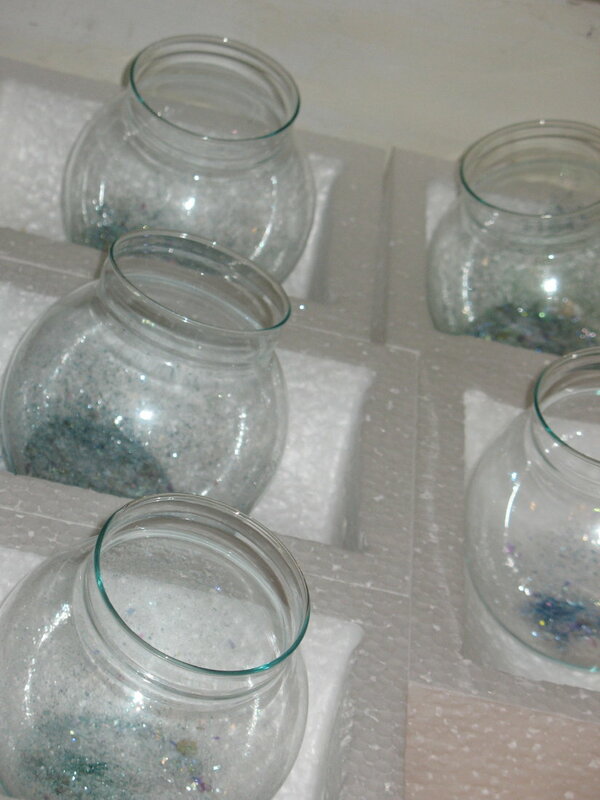 Then we had the kids just choose their glitter and put them into the globes, which I kept in their styrofoam cases so that nothing would break. After everyone went home, we let the figures dry for 24 hours, then set up an assembly line to add water and seal them. Which we were doing on Thursday night, the night before Christmas Eve. Like a couple of idiots. Or, really, like one chick who’s an idiot and one unbelievably helpful and accommodating husband. After my penguin-flipper-bust-out fiasco, I was afraid to do the actual assembly, so I left it to Cute W. He had to gradually and carefully easy the rubber stopper on, letting excess water spill as he went. 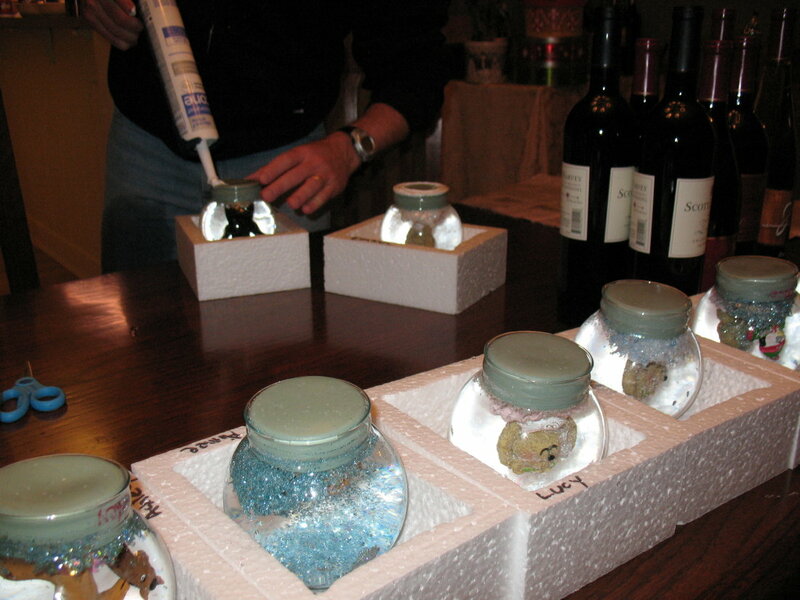 On Christmas Eve morning, we used more silicone sealant to attach the globes to their wooden bases. And then we delivered them to our guests who were still in town. I was never so relieved to get rid of a craft. Except that when my friend C was unexpectedly out, I left it on her porch. And then arrived home and Cute W was like, umm, it’s going to freeze and burst. Oh, yeah. It’s a good thing he’s around. I jumped back into the car. Anyway, I wouldn’t recommend this project for a group party, but the results sure were cute if you wanted to make a gift for someone. I bet that those ornaments are on sale at Oriental Trading right now, too. 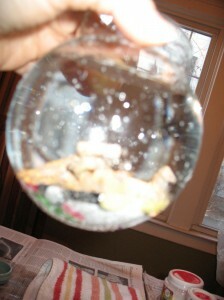 Some of our glitter appears to float no matter what, which hadn’t occurred to me. 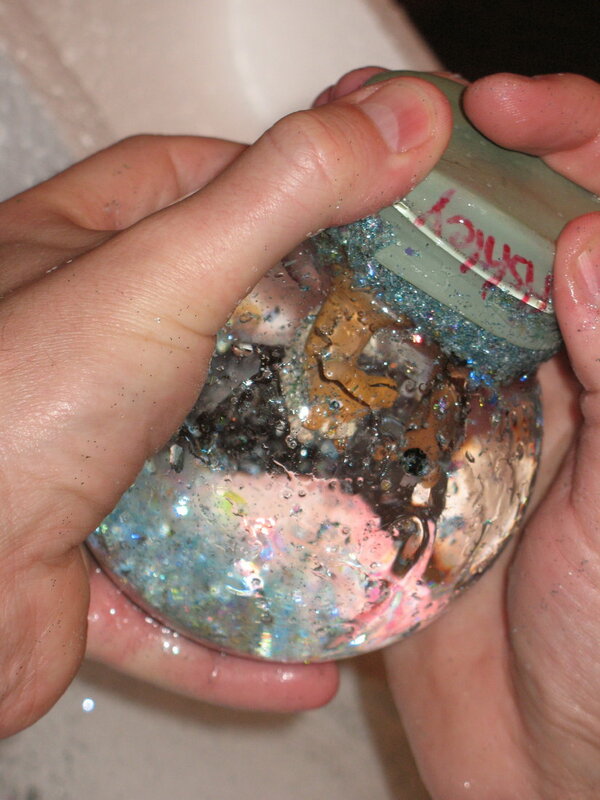 So if you wanted to try, do a “float test” with your glitter, or try egg shells as one of the linked directions above suggests. The girls were happy with the craft, and we supplemented with felt ornaments and fairies, since I had supplies for those. 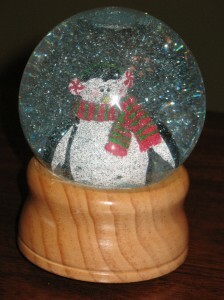 I still aspire to get snow globes made for each set of grandparents, but I need a chance to gather some steam before I can think of facing the project again. Right now I’m still trying to catch up on my post-trip laundry. oh god – i’m sorry i even suggested this. not that i need to add salt to your wound, but here’s how i did it….baby jar, hot glued little ornament into florist foam, hot glued that to the lid, added water, food coloring, glitter (maybe something else – baby oil??) and attached lid to jar with hot glue. it’s still sealed from last year. i don’t think you will ever attempt it again though. maybe you should write the product review for oriental trading! Oh, I know, Julie. That’s how I could have/should have done it. But I just had to take it up a notch. I’ll have to tell W that your glue is holding, though. And the girls all loved them, so now that it’s over, I’m not sorry. This is Selin from Turkey. I loved your snow globes and want to try it also. But the stopper is a really big problem for me. It is hard to find it in here. I’ve been searching for it for 5*6 days. So i want to ask you that how can i find the same “rubber stopper” which you used? Can you tell me where did you buy them? Or could you please share with me the adress of your craft store, so that i an order some of them.